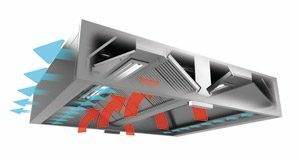 The top-of-the-line exhaust hoods boast with increased capture and containment efficiency and an air supply feature, which allows to introduce fresh air directly under the exhaust hood and help to establish comfortable working environment. HFCD exhaust hoods come complete with high efficiency cyclonic filters. Filters exploit centrifugal force to extract grease particles with efficiency of up to 95%. Filters are made completely from 0,8 – 1 mm thick stainless steel and have a fully closed rear side. The design reduces fire hazard and ensures that highest fire-safety standards are met. Large number of accessories available, including recessed LED luminaires.